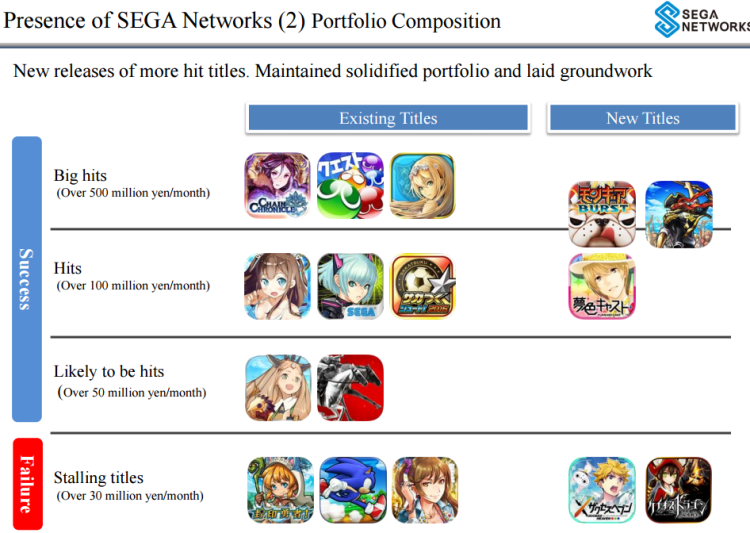 SEGA Networks has now put up a list on how their mobile games are doing including which ones have became big hits and which games are considered failures. Sonic Runners is down at the bottom, now considered a failure by the publisher. According to SEGA, the game has been making less than 30 million yen (about $260k USD) per month while brand new IPs like Masayoshi Kikuchi‘s (Jet Set Radio creator) Sen No Kaizoku (War Pirates: Heroes of the Sea) has become a big hit. All signs point to Sonic Runners being a big flop, and with negative fan feedback it might be too late to get consumers interested again even if SEGA changes the game. Check out the breakdown on all the games after the break. Sega needs to be thinking global with its game roadmap. Even some excellent ports of Virtua Cop 2 and Gunblade NY, would be doing wonders versus what’s there right now. When people ask why Sonic 3 & Knuckles is not getting the go-ahead, it’s because the bean counters don’t realize the chart-topping Christian Whitehead games out sell the Sega Networks in-house titles. Sega needs a mobile gaming expert that both knows Sega’s past, and can pilot Sega’s future. I expected this to happen. When you look at the game, the microtransactions ruin the entire game experience that its just not worth getting into. SEGA’s in house is really a joke. They literally can’t even realize what wrong they have done over the years. What a joke. If Sega went out of their way to fix the issues Sonic Runners had, it probably would have been a lot more successful. The game has been broken since the soft launch and not once did they fix any of the issues. Where was this portfolio published? I don’t see it anywhere on their site? In the body of the article you state that it’s been making less than 30 mil JPY per month… but the official document categorizes it as making more than 30 mil. In any case, it’s no wonder so many developers are shifting to mobile titles… These games have outrageous profit margins. Why they release that? Too much obvious the obessesion. And then comes sonic runners. This pattern is known in every franchise. Too much brings tired man. Looks like Runners is finally starting to fade into obscurity like the previous Sonic mobile game (Jump Fever, Dash). Then again it’s not like Mobile games were ever memorable to begin with. Never expect Yumeiro Cast became a success, more succesful than Sonic Runners. I mean.. the game is intended for females. I guess Japanese female gamers are willing to spend much money on the games they like too. Probably because that game didn’t have the huge backlash Runners had. Where’s the numbers for PSO2es? Chain Chronicle is successful = Let’s shut it down. SEGA makes no sense sometimes…unless they plan on carrying it on in a sequel. SEGA didn’t shut down Chain Chronicle. What happen is that SEGA signed a contract with Gumi so they can be the publisher of Chain Chronicle outside of Japan. SEGA Japan just announced the franchise is getting a anime in Japan, no way will they shut it down there. 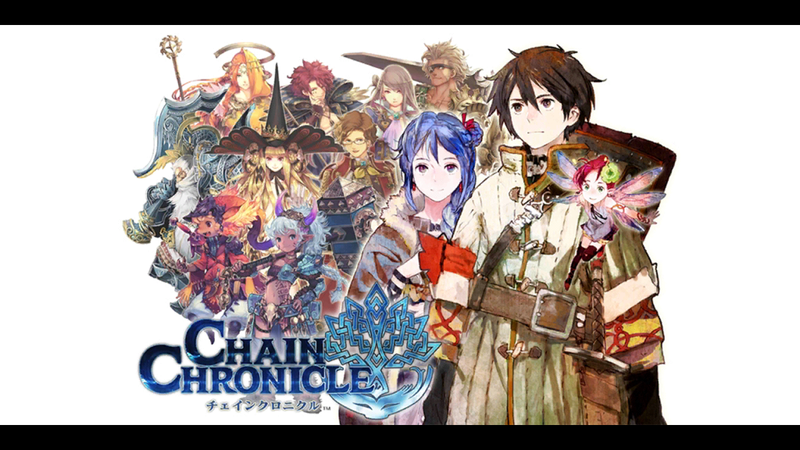 Gumi is shutting down Chain Chronicle Global, which is way behind on updates and screwed. I’m hoping this means their contract is up and SEGA takes over world wide (I can wish). The game has been making 4 million + a month for 3 years, its not shutting down. I never saw Sonic Runners on the US iTunes store, only Canadian, so that probably doesn’t help. I’m not creating an iTunes account for a mobile game. There’s better sonic titles out there for sure.